Blog | March 2019 | How To Make Three Professional Looking Cards! How To Make Three Professional Looking Cards! A handmade card is such a special way to show your loved ones how much you care. They are great for any occasion, whether that’s a birthday, christening, wedding, thank you or simply just to say hello. We understand it can sometimes be a little overwhelming with all the different types of cards out there so we’re going to share our favourite three today. These three designs will leave you lovely, high-quality handmade cards that are certain to impress. If you’re worried about skill level, don’t be! We’ve got you covered with a beginners, intermediate and advanced card so you can all join in. Our first card shape actually uses a card blank. This is a great starting point for any crafter and still allows for many fabulous designs. One way to get a professional look with handmade card is to use dies. This allows you to get fun lettering and/or designs with just a turn of a handle instead of trying to use a scalpel. Another way to give a card a professional look is to add some sort of foiling for added interest! The following card will include both of these things for a simply stunning design sure to impress. 1. Cut a 6”x6” square out of the yellow paper from the First Edition Chasing Rainbows Paper Pad. 2. Cut a 6”x6” square out of the A4 Premium Mirror Card – Rose Gold. 3. Using the alphabet dies cut out the world “HELLO” and repeat in a cascading effect. TIP: If you don’t want the dies to move, use a small amount of washi tape to secure them in place as they go through the die machine. 4. Attach the 6”x6” square of the A4 Premium Mirror Card – Rose Gold to the card blank using double-sided tape. 5. Attach the 6”x6” square of the yellow paper from the First Edition Chasing Rainbows Paper Pad (now with die cuts) to the card blank on the foiled side. Now you’re done! You have your very own die cut card with a foil effect that was done in just five steps! Why not mix it up with different papers and dies for a completely different look? We’ve just released a whole new range of First Edition dies perfect for just this. Click here to find out more! Another way to make a card look even better is to dive into the world of card shapes! There are a whole range of shapes you can create from the super simple to the extremely complex. Today we will be using the gatefold method which is a great entry level fold perfect for those just entering the world of card folds. We will be carrying that lovely foil through to this card as well as adding a readymade sentiments and gems for and extra special touch. 1. Cut a piece of the pink floral paper from the First Edition Forever Free 12”x12” Paper Pad in half. 2. With 1 of these rectangles, mark the half way point across the 12” side (This should be 6 inches) and fold each end towards this point. 3. Using the free paper with the bunny design, cut 2 rectangles measuring 2.5 x 5 inches. TIP: We have accented ours with Dovecraft Coloured Card in Fuchsia. This gives your card a little added interest and makes the designs pop. 4. Stick these rectangles to each side of the gatefold. 6. Attach this to the gatefold in the middle, making sure to only stick down one side so the card can still open. 7. Add a sentiment of your choice and a few gems to finish! Now you have you own fabulous gate fold card sure to charm anyone that receives it! This card was created as part of our Three Stunning Card Shapes with our FREE Spring-themed Papers article. There are so many more great free papers and a couple more designs we just know you’ll love. Check them out here! 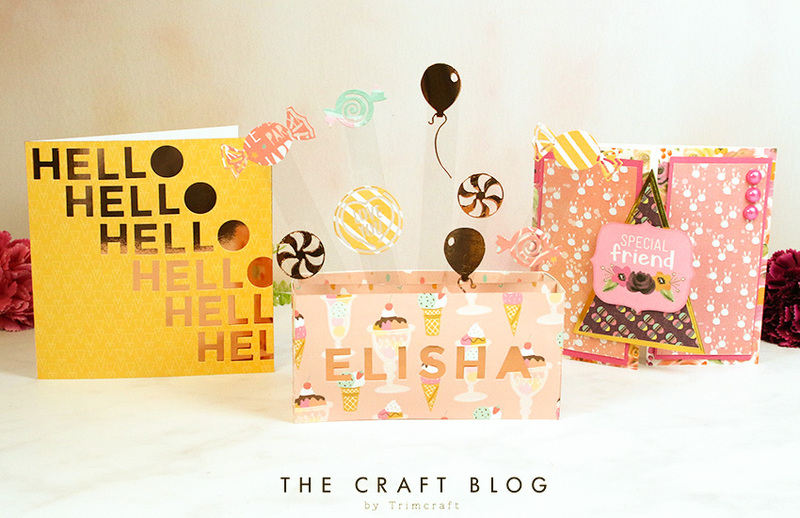 We’ve made it to our advanced card shape for this post, the pop up explosion card! This card shape looks incredible and certainly has the wow factor you’re looking for. This card includes all of the skills we have previously learnt as well as a new floating element. Why not take your craft to the next level with an element of personalisation? Die cut a name into the front of your card to make it extra special. 1. Cut a piece of 12”x12” Dovecraft Make a Wish 12”x12” paper in half. We have used the ice-cream paper for added sweetness. 2. Take one of the halves and mark 3 inches into the paper from the side measuring 6 inches. Make sure to draw a line at each inch. 3. Score and fold along the 1 inch and 3 inch marks. 3. Halve this paper length ways so you have 2 3”x12” lengths on paper. 4. In the middle of one half, die cut a sentiment or name. Back this with a contrasting paper to make it stand out. TIP: Instead of using a contrasting colour, try a foil card to create the allusion of foiled wording. 4. Attach these pieces of paper together to form the outside of your box as shown below. TIP: Add a 6”x3” panel of co-ordinating paper at the back to cover any blank spaces. 5. Cut an 8”x3” rectangle out of co-ordinating paper. 6. Mark 1 inch in from each side measuring 3 inches. 7. Score and fold along the lines and attach to the inside of the box as shown below. 9. Die cut various sweet treats from different coloured papers. We have used some foil and some of the co-ordinating papers from the Dovecraft Make a Wish Paper Pack. 10. Attach these die-cuts to the card using different lengths of acetate. This will give the allusion of floating sweets coming out of the card. Now you’ve finished! You have your very own pop up explosion card, how amazing! This is the perfect way to challenge yourself as a crafter and show your loved ones how much you care. This card was inspired by the lovely Angela Dodson who created this incredible pop up style card on the gallery! These are just our top pick for you but there are so many more amazing card shapes to try for all skill levels! Our design team have a world of inspiration on the blog and social media so make sure you’re following us to keep up to date! These are our three professional looking handmade cards, will you be giving them a go? We’d LOVE to see if you give these a try, so don’t forget to #Trimcraft when uploading to social media, and to share your beautiful crafts in the Inspiration area.